It might sound like a big company doing lots of things and researching new regions and topics but it all comes down to just Ros & David Brawn. When we started out with our first Tenerife South Walking Guide our aim was to tempt ordinary tourists "off the beaten track". 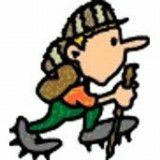 Since those early days we have come a long way, and walked even further, in our pursuit of producing the best Walking Guides. Thank you to all those travel writers who have written so enthusiastically about our guides, and to all of you who have written to us praising our work. We are often saying that our work is much more fun than most peoples' holidays, and it still applies.